Vitamin K2: Are you getting enough to keep your arteries clean? © Limarie Cabrera. Pastured eggs are a good source of vitamin K2 with 10-20 µg per yolk. The deeper the orange color, the more vitamin K2 it has. Eggs are also a great source of vitamins B12, A, D, E, choline and selenium. When researchers look at people’s vitamin K2 status, they find that almost everyone is deficient. This is very bad news because vitamin K2 is needed to get calcium in the right place in your body — in bones and teeth and out of arteries and heart valves. It does this by activating specific proteins like osteocalcin which attracts calcium to bone, and matrix gla protein (MGP) which moves calcium out of soft tissues like arteries. When researchers look, they find “uncarboxylated” proteins, which means there’s not enough vitamin K2 to activate them. Blood tests that measure the amount of active vs. inactive MGP are now being used to predict how much arterial calcification there is. The extremely serious problem is that our foods don’t contain the amount of vitamin K2 we need. Our livestock is often fed grains in feedlots and our chickens are not eating the wild herbs and insects as they should be naturally. Even the common practice of finishing grass-fed animals on grain means much lower vitamin K2. Animals convert the vitamin K1 in greens to vitamin K2 so if they’re not eating their natural diet, they’re not making enough vitamin K2. 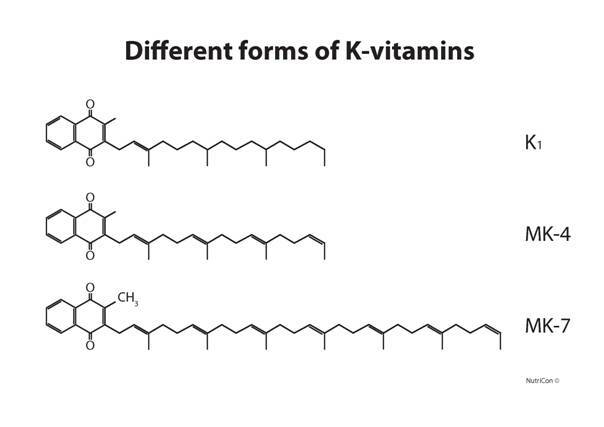 We can convert a little bit of vitamin K1 to K2 as well, but clearly, nowhere near enough. 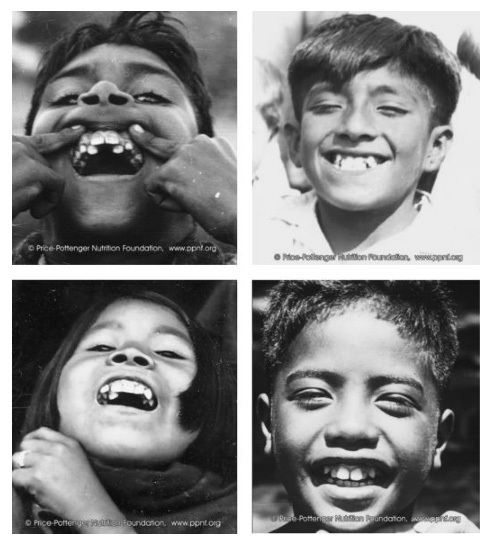 Teeth on modern foods, crowding and cavities. So many children have braces these days, a sad reflection of our poor nutrition. It’s a tragic irony that the bad advice we’ve been getting to avoid saturated fat and fear cholesterol has further dramatically reduced our vitamin K2, the most important nutrient for heart health. And to make matters even worse, those healthy fats have been replaced with vegetable oils with huge amounts of omega-6, driving chronic INFLAMMATION, another major cause of heart disease and almost every other chronic disease state. Vitamin K2 deficiency leads to weaker bones and heart disease. I’ll be blunt, it’s that serious. Without the proper amount of vitamin K2, not enough calcium can get in to bones, and we get calcification of the arteries — it even starts to look like bone, containing marrow! And we have an extremely serious situation at the moment where people are eating a lot of calcium believing it’s good for their bones, and that calcium is causing calcification of soft tissues instead because they don’t have enough vitamin K2. In the Rotterdam Study, men with the highest vitamin K2 consumption had a massive 51% lower risk of heart attack mortality, a 41% lower risk of coronary artery disease, and a 26% lower risk of death from all causes compared to men eating the least vitamin K2. The EPIC study found that increased intake of vitamin K2 could reduce prostate cancer risk by 35%, and that the benefits of vitamin K2 were most pronounced in advanced prostate cancer. A man with a severely calcified aortic valve took 1 mg of K2 as MK-4 and 100 µg as MK-7, as well as 1000 µg of vitamin K1 every day. In 10 months his heart valve was NORMAL and healthy. MK-4 or menaquinone-4 is found naturally in pastured eggs, meat and butter. And MK-7 is the type you would find in fermented foods like natto and cheese. Yes, vitamin K2 can reverse calcification of soft tissues like arteries. I’ve even read reports of varicose veins disappearing and tooth cavities healing with vitamin K2 supplementation. MK-4 and MK-7 are types of vitamin K2. Vitamin K1’s function is in blood clotting, not calcium metabolism. Ideally we want to get all our nutrients from food. If you can find truly free-range “pastured” eggs and can eat some Gouda or Brie every day and grass-fed meats (the yellower the fat, the more vitamin K2 it has), then you’ll be doing well. But doing it consistently is a real challenge in the modern world of industrialized food. And vitamin K2 is so critical to health that I think for most people, a supplement is necessary. Supplements come in the MK-4 and MK-7 types, with MK-7 being extracted from natto, and MK-4 being extracted from the tobacco plant. Personally, I think it’s best to use the MK-4 because MK-7 types are easy enough to get from food. For example, 100 g of Gouda has 76 µg and Brie has 57 µg of vitamin K2, mostly MK-7. Also, my feeling is that the MK-4 form is more in line with our natural diet, the main form in eggs, butter, meat and organ meats. The optimal doses for supplementation aren’t known yet. But I am hearing good things about 1 mg per 25 lbs body weight a day as MK-4 as a therapeutic dose, perhaps reducing to 1 mg a few times a week for maintenance once we have our beautifully clean arteries sorted. Early studies used large doses of MK-4 of 45 mg a day (15 mg with each meal) with no ill effect and vitamin K2 has no known toxicity. The right dose for you will depend on your current situation and aims — maintenance and prevention or reversal of calcification. I’m currently using Carlson Labs 5 mg once a day, and then when they run out, I will switch to Thorne Research MK-4 drops and just have one drop a few times a week. The man who reversed his calcified aorta was no doubt using Life Extension Super K, currently the #1 best seller combination vitamin on Amazon. Daily doses for supplemental MK-7 are a lot lower: 100 to 200 µg. 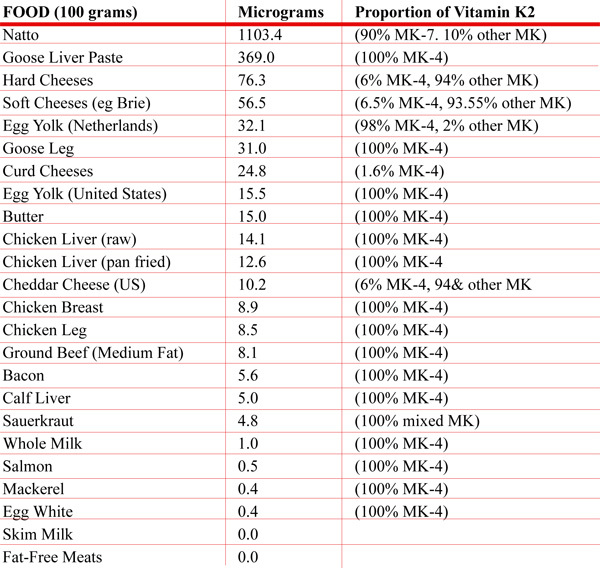 For more info about vitamin K2 in foods, see the USDA tests, 2006. Although vitamin K2 is incredibly important because of its unique functions and because 80% of us are deficient, it’s just one factor of many we should aim to optimize every day for best health and happiness. The truth is that we need to balance calcium, magnesium and vitamins A, D, and K2 in our lifestyles because all these nutrients are intimately connected. What’s really happening in people’s lives is a lot of calcium and deficiency of the others. I do a lot of dietary analysis, and B12, D, A, K2 and magnesium are the nutrients that will probably fall short if you’re not consciously seeking them — the very ones we need to balance calcium. Everything affects everything else. Warning: If you are taking Warfarin, please click here to read about Warfarin and vitamin K, and talk to your healthcare provider before altering your vitamin K2 (or vitamin K1) habits. For any fellow Irish readers: It seems to be impossible to get the MK-4 variety of K2 in health stores here (either offline or online), so recommend ordering from Amazon UK.